On Sunday 4 March there will be an excursion to a talayotic site organised by the Consell Insular (local Island Government) and GOB in order to combine the discovery of some of the sites on the island with scientific information on the talayotic world. 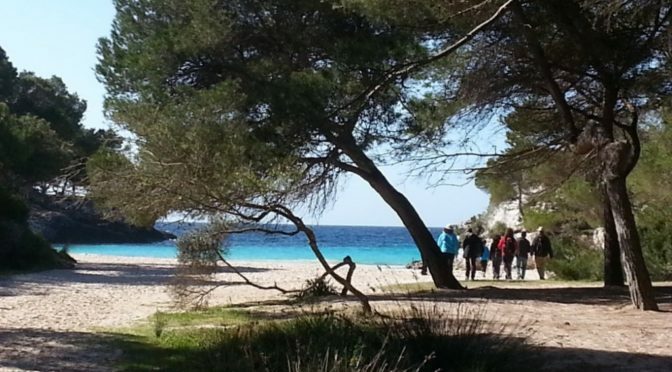 On this occasion the walk will be along the virgin coastline south of Ciutadella to visit Son Catlar, an ancient site where a monumental stone wall has been preserved as well as three talayots and an enclosed table. This is an activity organised to mark the Day of the Balearic Islands. There is no booking required. Meet at 9.30 am in the car park to the Cala en Turqueta beach. A voluntary meeting at the Poliesportiu in Mahon can be made for those willing to share a car to Cala en Turqueta car park. We will start the walk at 10 am. The walk is not difficult although a good part of it will be along the Camí de Cavalls. Visits to the site will be in groups guided by archaeologists. There will be a free bus service by courtesy of the Consell Insular to return to the car park. The excursion is estimated to end at 13.30 hours.